Perfect for beginners in the kitchen and everyone who is time-pressed but would still like to eat tasty, homemade food, this is the ultimate cookery reference book. 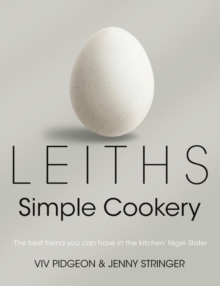 "Leiths Simple Cookery Bible" contains a colossal 700 recipes that are foolproof, delicious, easy to follow and utterly reliable. Covering soups, tarts, snacks and sandwiches, salads, main courses, accompaniments, puddings, baking, preserving, drinks, breakfasts and the all-important basic recipes, this terrifically comprehensive book has every recipe you'll ever need, from spaghetti Bolognese, sausage hotpot or shepherd's pie to salmon with dill and mustard crust, couscous stuffed peppers or sweet chilli beef. Recipes come complete with 'prepare ahead' instructions in case you want to cook them in advance, making it easy to rustle up quick after-work suppers, or to cook for friends and family without spending all your time slaving in the kitchen.They can be adapted to whatever you have in your cupboard at home (the book contains a special section on substituting ingredients), they can be made with convenience ingredients (like ready-rolled pastry and bought pesto, which come with recommendations on the best brands to choose), and the 'basic' recipes contain delicious variations that will enliven every meal. With 100 color photographs, conversion tables, a glossary of terms, illustrated techniques tips (from whipping cream to cutting a mango), a guide to wines and cheeses, a seasonal table of fruit and veg, and much more, this is the cookery book you will turn to every day. It is a collection of recipes for real life, and one with inspirational ideas that will make ready-meals a thing of the past.